Hello, students, and welcome back to school! I’m Abby Payne, and I’m the 2015-16 editor in chief for the Weber State University campus newspaper, The Signpost. When I first came to “The Signpost” in spring 2013, I was in a bad place. I had just switched majors from radiology to vocal performance, I had no friends and was far away from home. There were many days when I felt all alone in a sea of people. Then I found The Signpost. Constantly talking to new people and putting myself in new situations was hard work at first, but The Signpost helped me get to know so many people and parts of campus that I otherwise would’ve never explored. Through those growing pains, I found out who I really am and what I want most out of life. As the editor in chief, I am excited to give back to the institution and people who have given me so much, and I have a few goals to get us there. First, The Signpost is your voice to Ogden and the surrounding communities. As students, faculty and staff at Weber State, The Signpost is your paper. 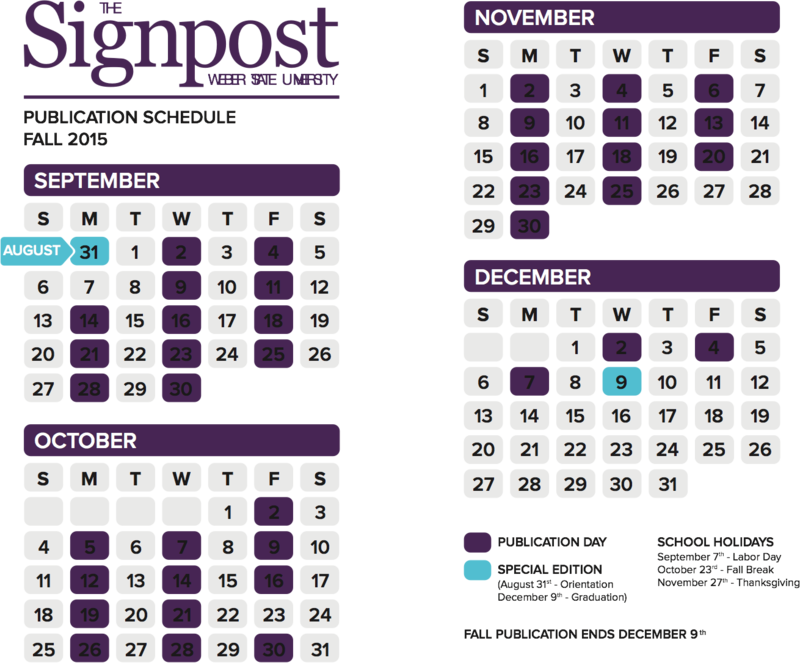 The Signpost covers events that are important to you whether they are here on campus or anywhere else in Ogden and the surrounding areas. Please feel free to pop into the office—it’s on the fourth floor of the Shepherd Union—and talk to me or any of The Signpost staff about your ideas and opinions of current events. As editor in chief, I can promise students, professors and anyone else who reads The Signpost the most accurate and engaging newspaper that we can produce. I am personally committed to making The Signpost a place where students of all majors and walks of life can come to learn, grow and become the people they want to be. Just as so many advisers, professors and administrators have done for me, I am here to make sure that all who read and participate in The Signpost come away having learned something about themselves and about the world around them and have the best experience they can possibly have at WSU. If you see something in The Signpost that you think is inappropriate, inaccurate or if you don’t see something that should be in our paper, contact us so we can do something about it. However, please realize that The Signpost is a student newspaper, and we are all here to learn and that we will make mistakes. We appreciate your constructive criticism, but understand that we won’t be perfect. I so look forward to creating The Signpost for Weber State University this year! Good luck, and go Wildcats! Trump vs. Ramos ¿Quién tuvo razón?